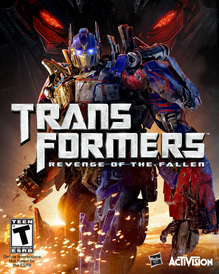 The Games on Demand version of Transformers: Revenge of the Fallen was delisted on Xbox 360 on December 31st, 2017. Like many previous licensed Activision franchises Transformers: Revenge of the Fallen was delisted at the end of the year in which the license expired alongside several other titles in the Transformers series. See the linked pages to the right for more. Transformers: Revenge of the Fallen remains available on physical media for all platforms it was released on. “The Transformers: Revenge of the Fallen video game is based on the upcoming live-action feature film from DreamWorks Pictures and Paramount Pictures in association with Hasbro, which opens nationwide on 19th June 2009. * The game lets players take on the role of their favourite AUTOBOTS or DECEPTICONS, picking from the largest, most diverse range of playable Transformers – each with their own distinct abilities and weaponry. Set in unique environments across the globe such as Cairo and Shanghai, the game allows players to instantly switch between vehicle and robot modes as they drive, fly, fight and blast their way through intense, pressure-packed levels. After engaging in single player action players, for the first time ever, will be able to go online and battle friends in all-new multiplayer modes.